After 30 years of playwriting, we finally try our hand at a book! 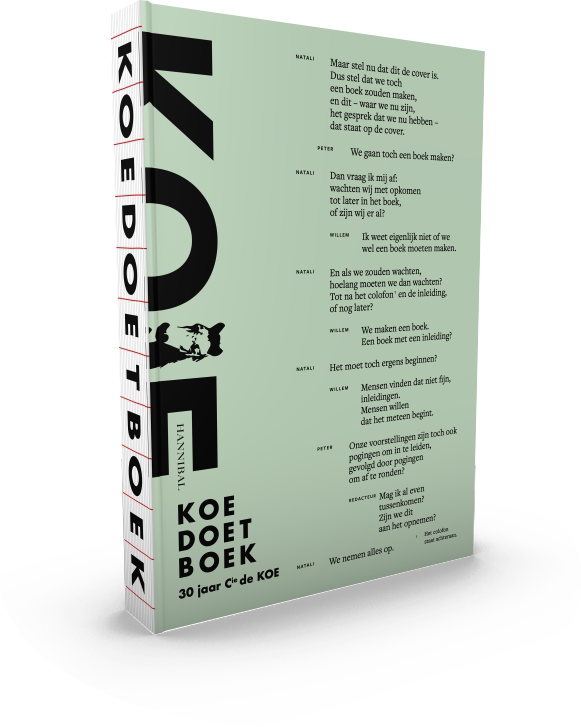 A book which asks the question how de KOE would make a book, a play on paper, an erratic and surprising work in which Peter, Natali and Willem - together with their co-author and editor Wannes Gyselinck - offer you a unique look at their philosophy and way of working. In short: a jubilee book only de KOE could have made. About everything we've left behind, and everything we've failed to leave behind. Leaf through pictures from thirty years of de KOE-pieces, finally get your hands on the - never before published - text of our first show, De Gebiologeerden, or get started yourself with the 'Vademekoe', a DIY-manual based on 40 frequently asked questions.